It was bad news for coconut oil last month after Harvard Professor, Karin Michels, blacklisted it as “one of the worst things you can eat”, dramatically claiming it to be “pure poison” for our health and contradicting so much of what we already know about this widely respected and enjoyed ‘super food’. When it comes to nutrition, it seems we’re not only faced with an overwhelming number of products to choose from, but even more so an overwhelming responsibility to know what is best for our health. But with so much contradictory research making headlines on a daily basis, no amount of detective work seems to make navigating the rights and wrongs of nutrition any easier. And on that note, introducing the master of all nutrition mindfields – cooking oils. Knowing which type to use and when to use it, in order to best support your health, is confusing to say the very least. Here to break it all down into – with the what, why and when – is Fresh Fitness Food’s nutritionist Georgia Head. Oil is essentially liquid fat. This description may sound off putting, but fat is an important part of a balanced diet. Dietary fat is a required energy source that provides the body with essential fatty acids. Essential fatty acids are vital for cell growth and functioning, as well as the functioning of the brain and nervous system. They also assist in the production of hormones which are necessary for the absorption of fat soluble vitamins A, D, E and K. ‘Essential’ means that these cannot be synthesised by the body and therefore need to be ingested from food sources. Fats can be broken down into saturated and unsaturated fats (mono, poly and trans), all of which have varying chemical structures and physical properties. Saturated fats are those which are solid at room temperature, for example those in meat, butter and coconut oil. 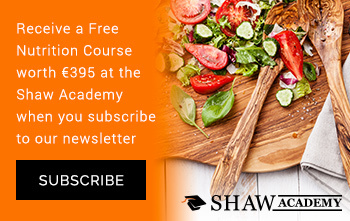 Over the years, saturated fats have been attributed to heart disease, but recent research has begun to find contradictory results, (de Souza et al., 2015 and Siri-Tarino et al., 2010). That being said and due to the contrasting research over time, it is recommended that no more than 10% of your total energy per day should come from saturated fats. Unsaturated fats include poly (oily fish, nuts and seeds) and monounsaturated (avocado, olives and plant based liquid oils e.g. canola and olive) fats, and trans-fats. Both mono and polyunsaturated fatty acids have been associated with reduced instances of heart disease (Clifton and Keogh, 2017) namely due to their ability to reduce ‘bad’ cholesterol in the body (LDL). Artificial trans-fats are made by adding hydrogen to liquid vegetable oils to make them more solid. They give foods a more desirable taste and texture and are often used in the fast-food industry. It is recommended we consume no more than 2% of our dietary intake of fat from trans-fats mainly due to their links with increased risk of heart disease (Sun et al., 2007). Oils can be categorised by several factors including taste, processing method and smoke point, all of which provide the oil with its unique qualities and therefore uses. Smoke point refers to the temperature at which oil begins to burn and smoke. The smoke point varies from oil to oil based on the quality of the oil itself, the processing it has undergone, and any impurities it may contain. 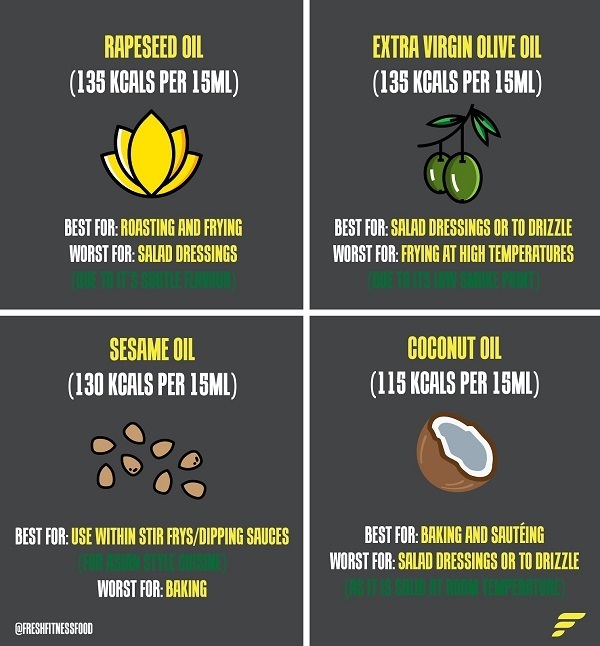 Refined oils are often neutral in taste and have high smoke points, whereas unrefined oils have low smoke points and tend to be more flavoursome. Heating oils beyond this point should be avoided as it results in the production of fumes and free radicals that can have detrimental effects on our bodies and our health. Rapeseed oil is extracted from the rapeseed plant which are widely grown in UK fields. It is used as the cooking oil of choice in the FFF kitchen due to it’s high smoke point, and low saturated fat and vitamin E content. Olives are crushed at a mill and the oil is extracted by a mechanical process, as opposed to using heat or chemicals. This process produces unrefined, high quality oil, which is full of flavour and contains more of the natural vitamins and minerals found in olives. Sesame seeds are pressed and crushed to produce sesame oil or it is solvent extracted and refined, producing oil of varying colours (depending on the methods used). It is usually equally high in both mono and polyunsaturated fats and relatively low in saturated fat. Coconut oil is extracted from the fruit of a coconut palm tree after the dried meat has been smoked, sun dried or kiln dried. It’s the the oil that has received the most attention in recent years, either as a superfood or super-villain ( “pure poison”). The recent cause for concern has been triggered by the fact that coconut oil is very high in saturated fat – studies have linked intake of saturated fat with raised levels of ‘bad’ cholesterol, which has been indirectly linked with cardiovascular disease (Sacks et al., 2017). However, it should be noted that there is also opposing research that suggests despite the type of saturated fat found in coconut oil (lauric acid), is not as harmful as it has been made out. Despite claims, more research needs to be done before making any reasonable conclusions in the coconut oil debate. As with any other sources of saturated fat, using coconut oil in moderation is recommend.